Summary: The manufacturer’s description and specs, pricing, photo and user ratings for the Wilson Combat Supergrade pistols. The Wilson Combat Supergrade is built on a fully machined frame that starts as an American made hammer forging, then hand-fitted to a slide with just the right amount of clearance. 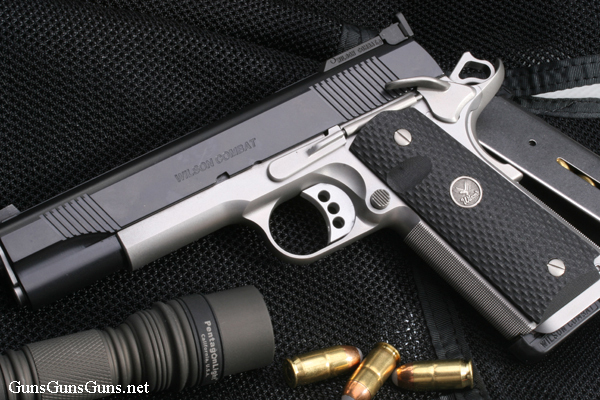 Wilson Combat Bullet-Proof parts are combined with years of pistol building experience. The Classic Super Grade features a stainless steel match grade barrel with a hand fitted bushing. We add our reliable, fully machined Lo Mount Adjustable rear sight and front post for a precise sight picture. The rear of the slide is checkered to eliminate glare and improve aesthetics. An ambidextrous safety, High-Ride Beavertail grip safety, skeletonized ultra-light hammer, and a magazine Speed-Chute are fitted perfectly and blended as required for both cosmetic and functional purposes. The Supergrade from the left. Complete reliability is assured with our Bullet-Proof extractor, extended ejector, throated and polished barrel and feed ramp, and the lowered and flared ejection port. The front strap and flat mainspring housing are checkered at 30 lpi for utility and appearance, and paired with hand-selected cocobolo wood grips for maximum control—and beauty. Available slide and frame colors include green, black, tan, gray and stainless. This entry was posted in .38 Super, .40 SW, .45 ACP, $4,501-$5,000, $5,001-$5,500, 10mm, 1911, 9mm, Full size, Semiauto, Wilson Combat on September 10, 2010 by Staff.